Trade in your woollen winter scarf for some colourful beads at St. Andrew’s Church (King & Simcoe Streets) on Friday, March 1. 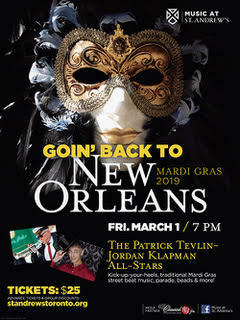 Join us for Goin’ Back to New Orleans: Mardi Gras 2019. The Patrick Tevlin-Jordan Klapman All-Stars will lead the way in this fun, kick-up-your-heels evening of traditional jazz. This band of top jazz players will perform popular classics such as Just a While to Stay and When the Saints Go Marchin’ In. In addition to great music, tonight’s program will include parades, beads and a reception with delicious King Cake and Hurricane Punch. Tickets are $25. Advance and group discounts available online only at standrewstoronto.org. Bring your friends!